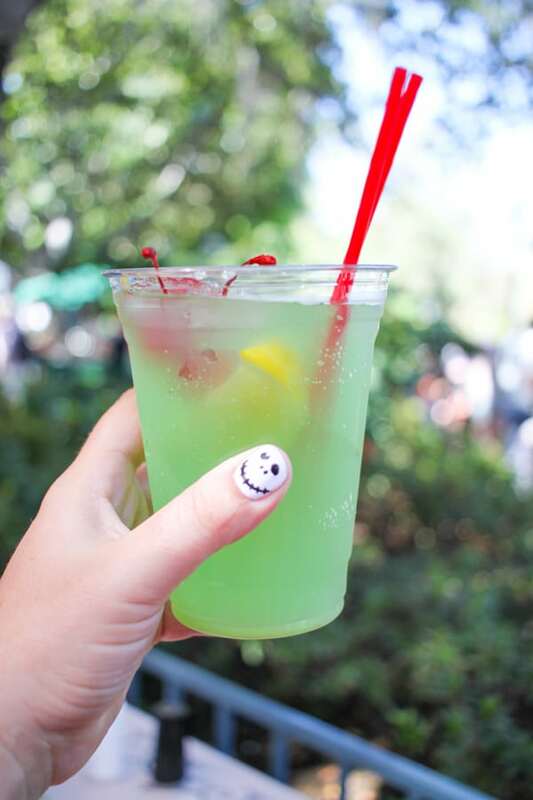 I’m really excited to share this huge list of twenty-nine amazing things to eat at drink at Disneyland. Disneyland is jam-packed with unique and delicious treats and creating this post has been a labor of love. I’ve been working on taking pictures of all of our family’s favorite foods at Disneyland for the past year and a half so I could compile them into one big post. Foodie culture is alive and well at Disneyland, and new menu items and seasonal treats are being added all the time. If you are planning a trip to Disneyland, these are some of the can’t miss, best things to eat and drink at Disneyland Resort. 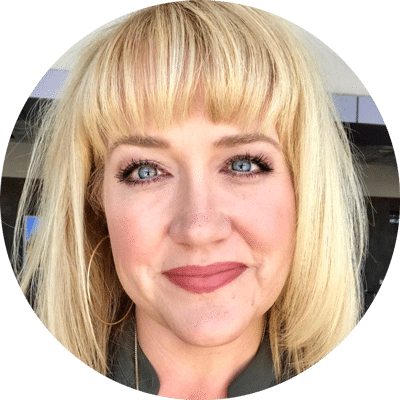 If you like this post, I’d love for you to Pin it and share via social media! 1. Hand-Dipped Corn Dogs from Corn Dog Castle at Paradise Pier in California Adventure – these corn dogs are so delicious, and are available from Corn Dog Castle at Paradise Pier in California Adventure or from the Disneyland’s Little Red Wagon at the end of Mainstreet. Corn Dog Castle has a bigger seating area, but the Little Red Wagon is a classic location! The corn dog is a great budget friendly option for lunch or dinner. 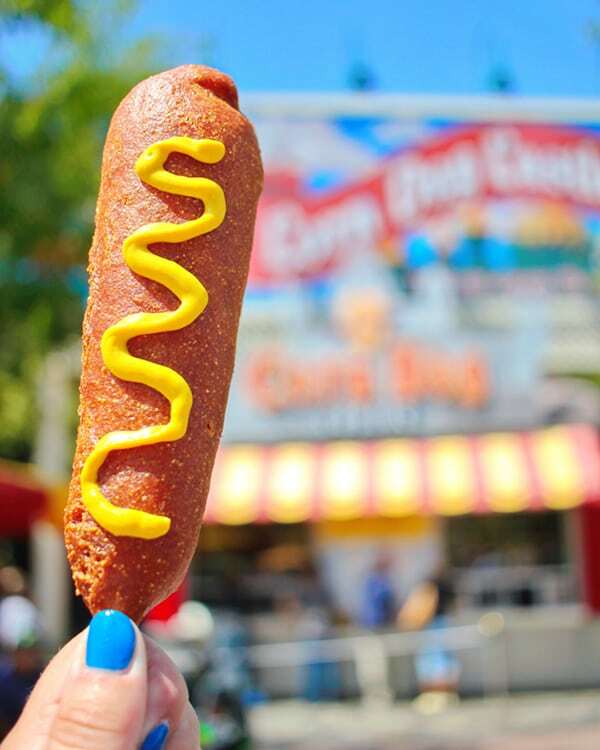 These corn dogs are popular, so try grabbing an early lunch or dinner to avoid the lines. 2. 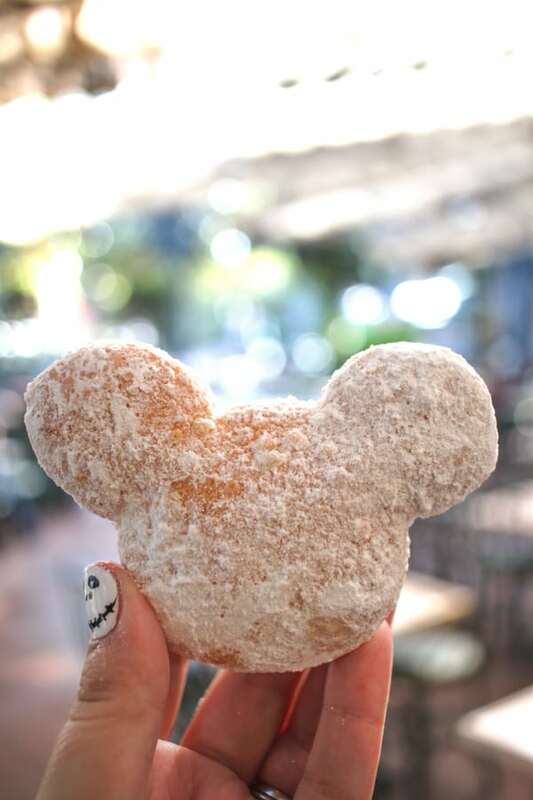 Mickey-Shaped Beignets from Mint Julep Bar in New Orleans Square at Disneyland– For a quick, sweet breakfast try these freshly fried beignets, you will not be disappointed. In the mornings, you can grab a bag of these warm beignets covered in powdered sugar and a coffee from the Mint Julep Bar in New Orleans Square. In the fall, Disneyland offers Pumpkin Beignets dusted with cinnamon and sugar, and they are totally worth making a special trip. You can also order the beignets at Cafe Orleans, a table service restaurant in New Orleans Square, and they are served with a vanilla bean creme anglaise and a fruit coulis for dipping that are out of this world delicious. 3. New Orleans Mint Julep from Mint Julep Bar in New Orleans Square at Disneyland – light and refreshing, this non alcoholic drink is a Disneyland favorite. It’s minty with a hint a lime, and very refreshing on a hot day! 4. 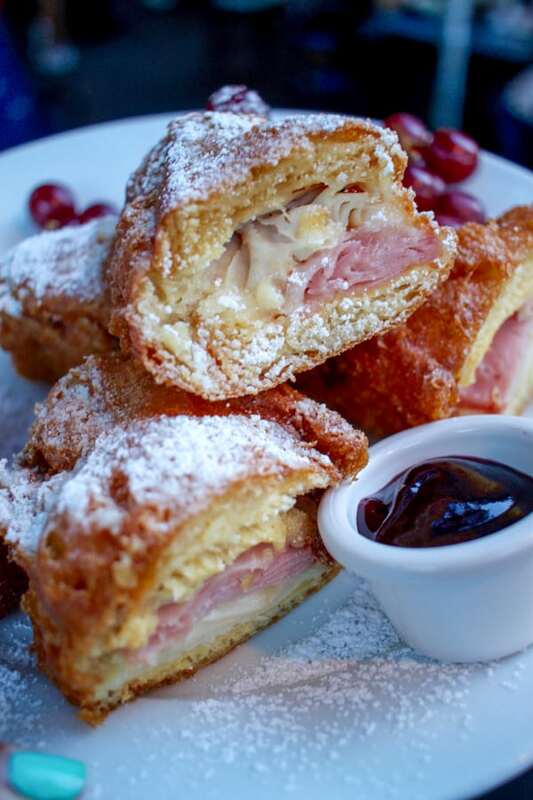 Monte Cristo Sandwich from Cafe Orleans in New Orleans Square at Disneyland– Found on the menu at Cafe Orleans, I’m betting you’ve never had a Monte Cristo Sandwich like this one. Ham, turkey and swiss cheese, lightly battered and fried. I recommend this to all my friends, and when people don’t order it, they always regret it! This is a Disneyland classic and everyone should try one, at least once. The berry puree and light dusting of powdered sugar is the perfect contrast to this rich savory sandwich. If this sandwich sounds weird to you, please just TRUST and try it one time. You will be hooked. A Monte Cristo on the beautiful patio at Cafe Orleans is my Disneyland happy place! 5. 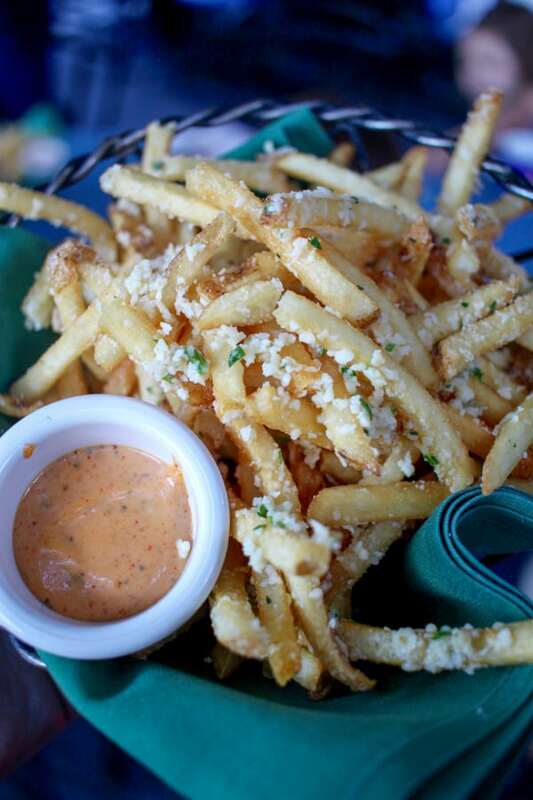 Pommes Frites from Cafe Orleans in New Orleans Square at Disneyland – These make the best shared appetizer, and pair perfectly with the Monte Cristo Sandwich. These golden french fries are topped with garlic and parmesan cheese and served with a cajun dipping sauce that is to die for. 6. 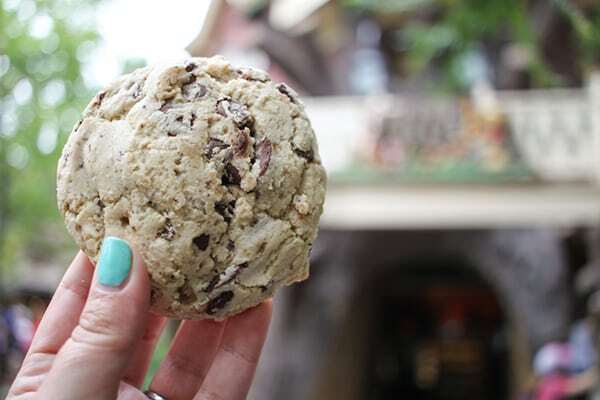 Chocolate Chip Cookie from Pooh Corner at Disneyland – I’ve become obsessed with this cookie. I have to confess, when at the Disneyland bakeries, I always bypassed the cookies because I didn’t think they looked that exciting. Honestly I thought they would be dry and hard, and I was so wrong. They are chewy and chocolatey and magnificent! This cookie is from Pooh Corner, one of my favorite places to visit in the park! 7. French Dip Sandwich from French Market Restaurant in New Orleans Square at Disneyland- for a hearty lunch or dinner, don’t miss out of this tasty french dip, available at the French Market Restaurant in New Orleans Square. Thinly sliced roast beef, piled high with crispy onions straws and a creamy horseradish sauce on a soft potato roll. 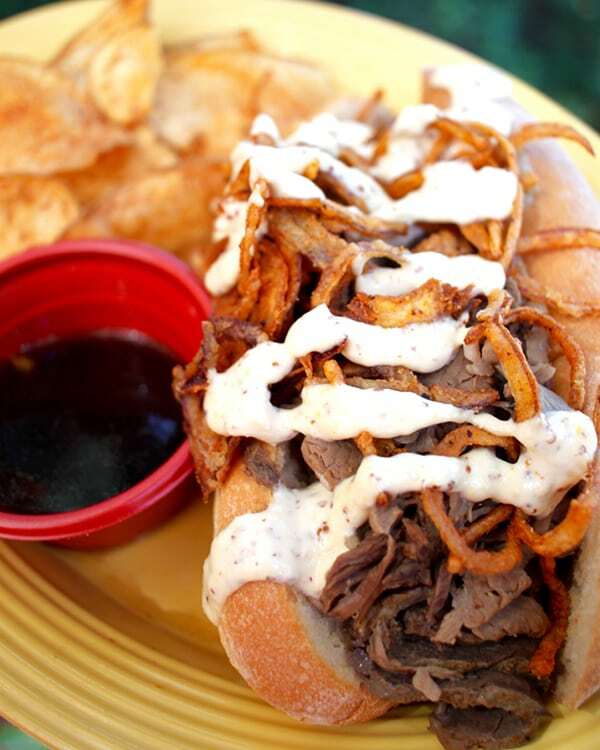 The Disneyland French Dip is a favorite for a reason, even the house seasoned cajun potato chips are yummy! 8. 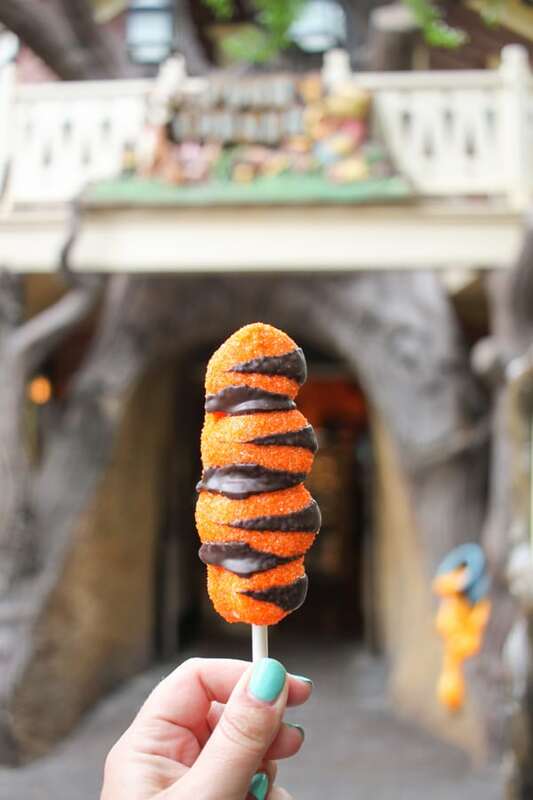 Tigger Tail Marshmallow Wand from Pooh Corner at Disneyland – handmade at Pooh Corner, this is a treat you can’t get anywhere else. Marshmallows hand-dipped in caramel and chocolate. My favorite part is watching them being made through the window at Pooh Corner! 9. Chili Con Queso from the Cozy Cone Motel in Cars Land at California Adventure – found at Cone 3 at the Cozy Cone Motel in California Adventure, this is one of my personal favorites at Disneyland. 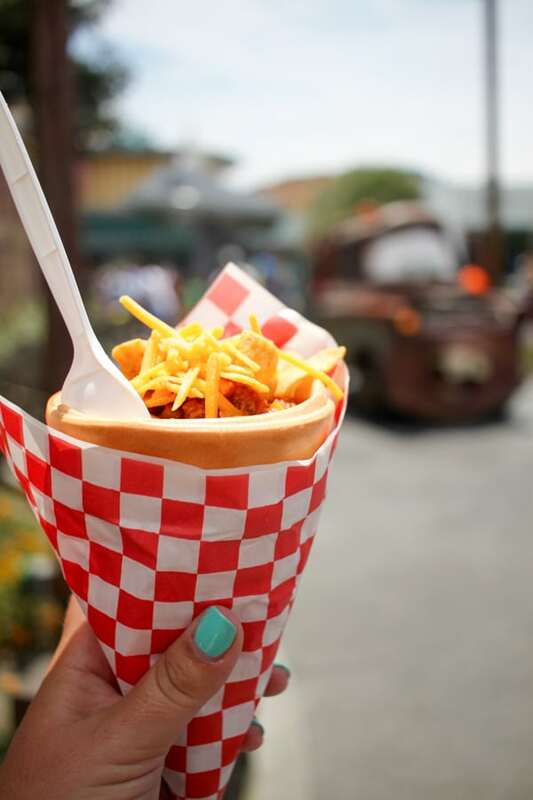 Flavorful hearty chili and cheese over fritos served in a handy bread cone. Great for eating and walking. 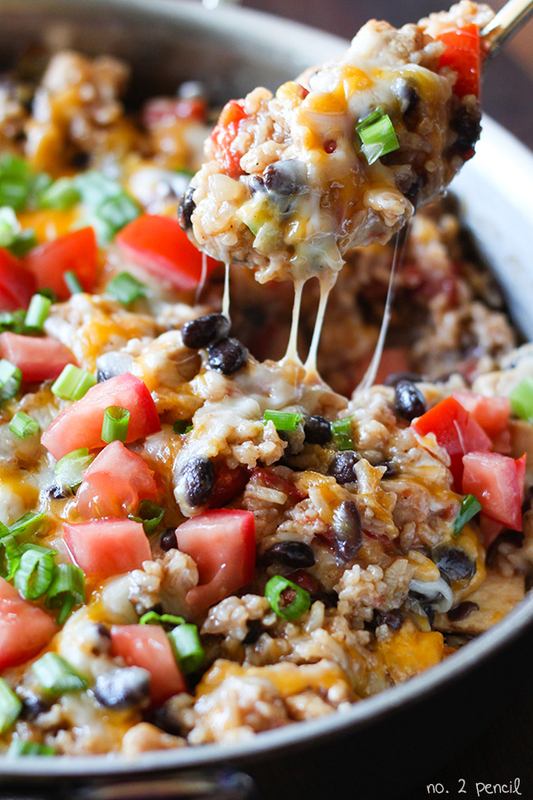 The portion in not huge, but it makes a good filling lunch or a hearty snack. If you take a picture, you might get a Mater drive-by photobomb like I did! You can also find breakfast cones at Cone 3, which are also very good! 10. 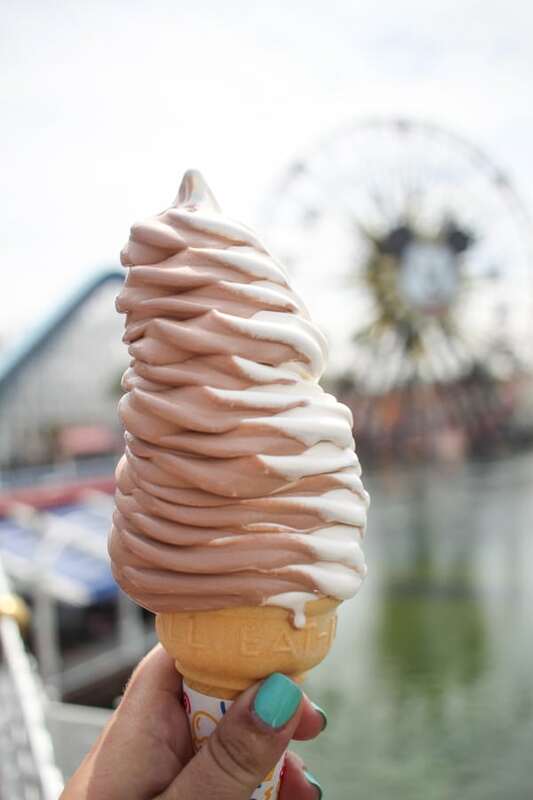 Large Swirl Soft Serve Ice Cream from Paradise Pier Ice Cream Company in California Adventure – if you are looking to cool off, run, don’t walk, to Paradise Pier for the best soft-serve you will ever have. The swirl is on point and the ice cream is rich and delicious. If you get a large cone, be ready for people walking by to ask you where you got that from and which way it is. 11. 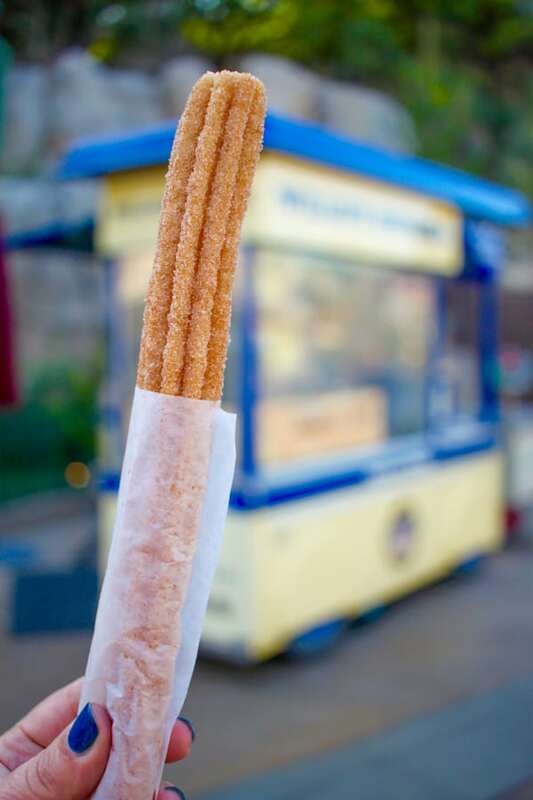 Churro from Disneyland Churro Cart – everybody’s favorite. Warm and soft and dipped in cinnamon and sugar. Disneyland churros make a great walking snack. 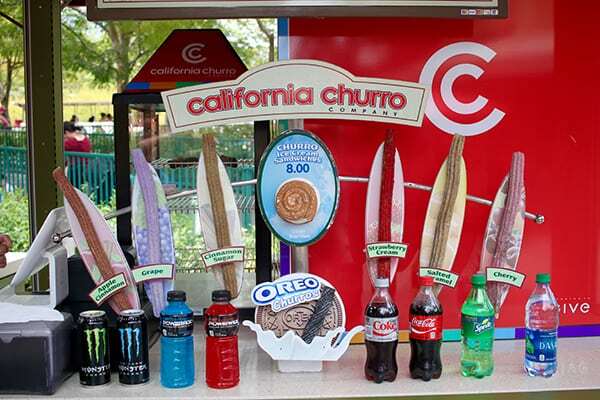 You can find Churro carts throughout both California Adventure and Disneyland. 12. Creamy Corn Chowder in a Sourdough Bread Bowl from French Market – this warm and cozy soup is a perfect lunch or dinner when the weather turns chilly! Delicious and so flavorful. 13. 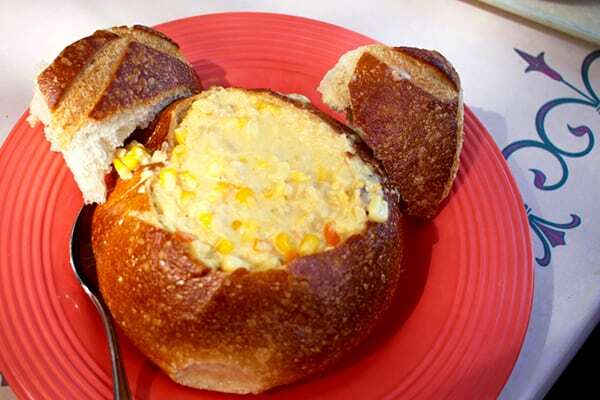 Clam Chowder is a Sourdough Bread Bowl from Pacific Warf Cafe at California Adventure – served in a mickey shaped sourdough bread bowl just like the corn chowder, you can also find this in two locations in the Disneyland park, Harbour Galley and Royal Street Veranda. Disneyland clam chowder is the ultimate comfort food to warm you up from the inside out on a chilly winter evening. Lines can get very long for this clam chowder, especially when it’s cold, but it is worth the wait! 14. 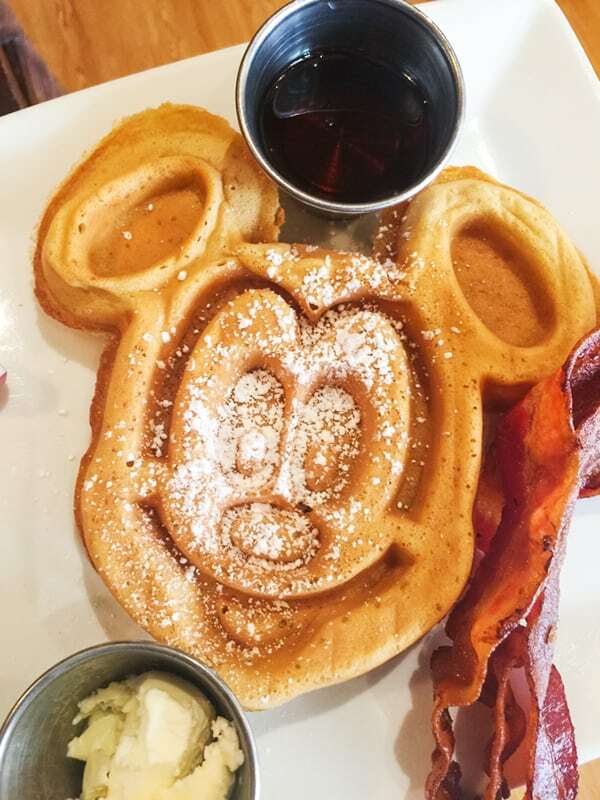 Mickey-Shaped Waffle at Carnation Cafe on Mainstreet – A Mickey waffle is a must for any Disney fan, plus Carnation Cafe has one of the best locations in the park. The outdoor patio is perfect for people watching. I recommend a late morning reservation so you can use the early morning to ride attractions before the crowds pick up. 15. Lobster Nachos from Cove Bar in California Adventure – One of my very favorite things to eat at Disneyland. Tucked away behind Ariel’s Grotto, you can find Cove Bar. They serve cocktails, beer, wine, non alcoholic specialty drinks and appetizers. They have a recently expanded outdoor patio to make room for it’s increasing popularity. 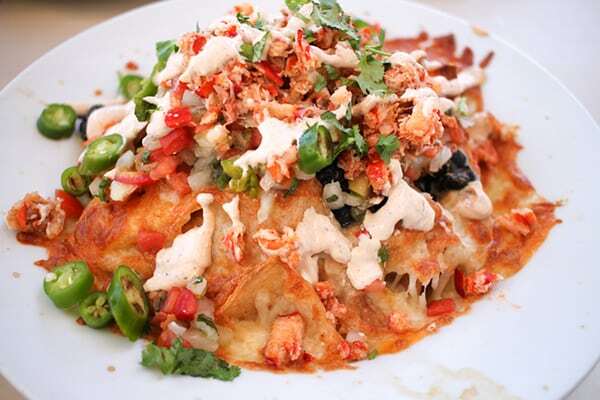 The lobster nachos are a can’t miss from there. Warm house-made tortilla chips piled high with hot melty cheese, fresh lobster, black beans, pico de gallo and chipotle creme. This are a must-try! 16. 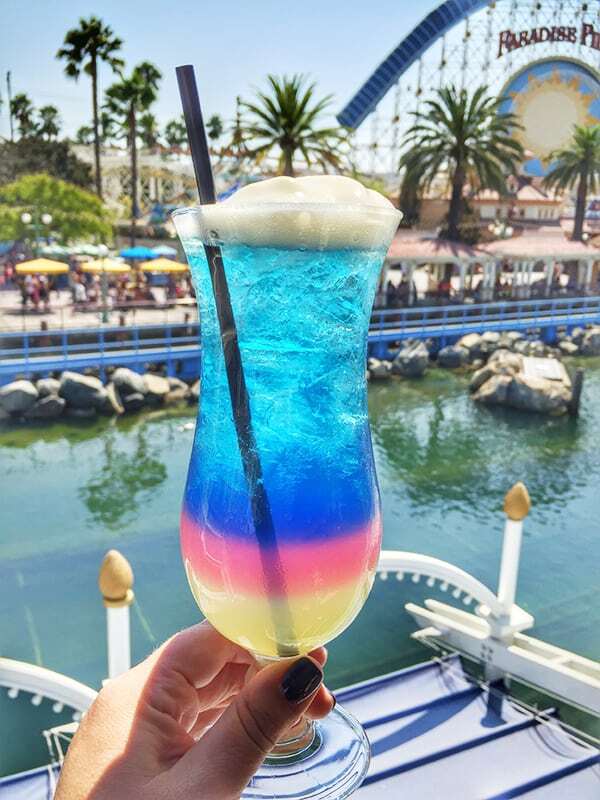 Fun Wheel from Cove Bar at California Adventure – while you are snacking on your Lobster Nachos, you may want to place an order off of Cove Bar’s secret menu. The Fun Wheel isn’t on the menu, but it’s the most popular mixed (alcoholic) drink according to our server. They also offer non alcoholic versions of the cocktails. I’m not sure what’s in the Fun Wheel, but it is fruity and delicious! 17. 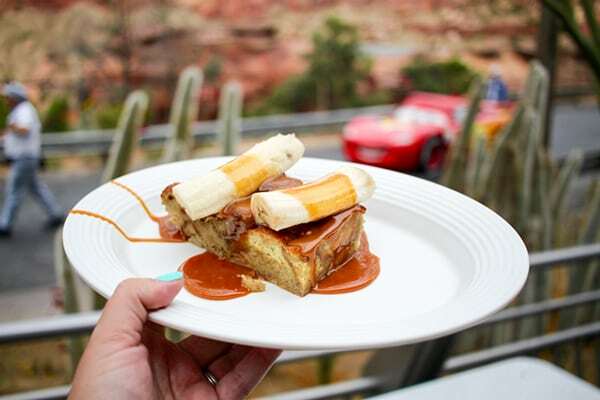 Brioche French Toast from Flo’s V8 Cafe at California Adventure – served with fresh bananas and salted caramel sauce, if you are looking for a sweet treat for breakfast, this french toast is a winner. Flo’s V8 Cafe has plenty of outdoor seating and a beautiful view of Radiator Springs Racers. You might even get to see Lightening McQueen himself driving past! 18. 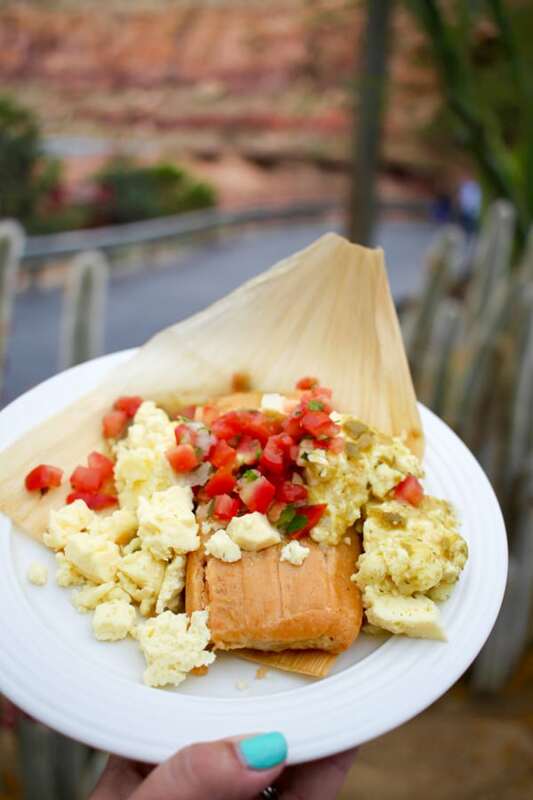 Chicken Tamale Breakfast from Flo’s V8 Cafe in Cars Land at California Adventure – If you are looking for something hearty and savory for breakfast, this chicken tamale is packed with flavor, and I love the pico de gallo! 19. 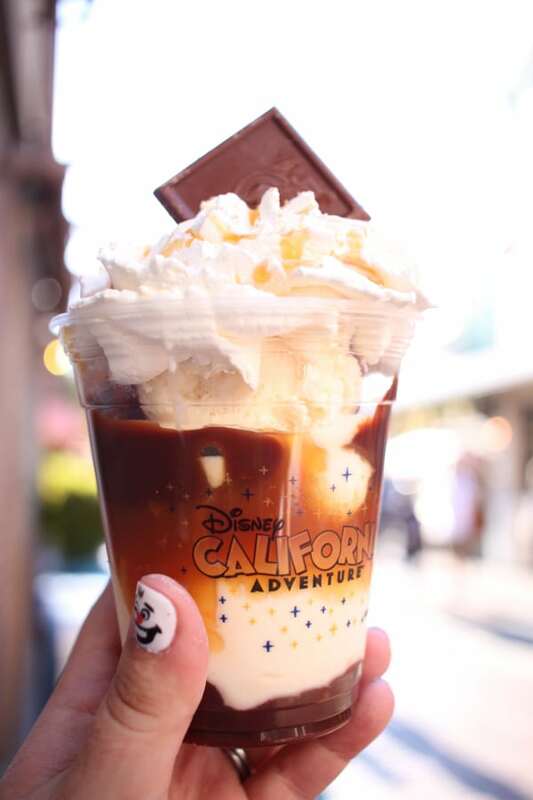 Ocean Beach Sea Salt Caramel Sundae from Ghirardelli Soda Fountain and Chocolate Shop at California Adventure Pacific Warf – Disneyland has a lot of delicious ice cream treats, and this is one of the best. Ghirardelli chocolate and salted caramel? Yes, please! 20. 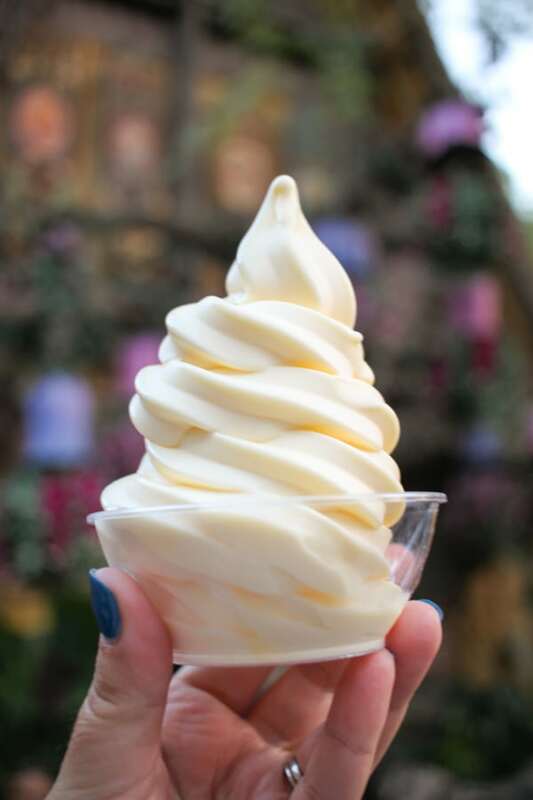 Pineapple Dole Whip Soft-Serve from the Tiki Juice Bar in Adventureland at Disneyland – If you are looking for a treat that’s light and refreshing and PERFECT on a hot day, you need to try the Dole Whip. This soft-serve has fans all over the world and it’s a classic Disney treat. Lines can get long at the Tiki Juice Bar, but a lot of people don’t realize that lines form on both sides of the hut. So head into the waiting area for the Enhanted Tiki Room, that line is often much shorter. You don’t have to see the show to take advantage of the shorter line. 21. 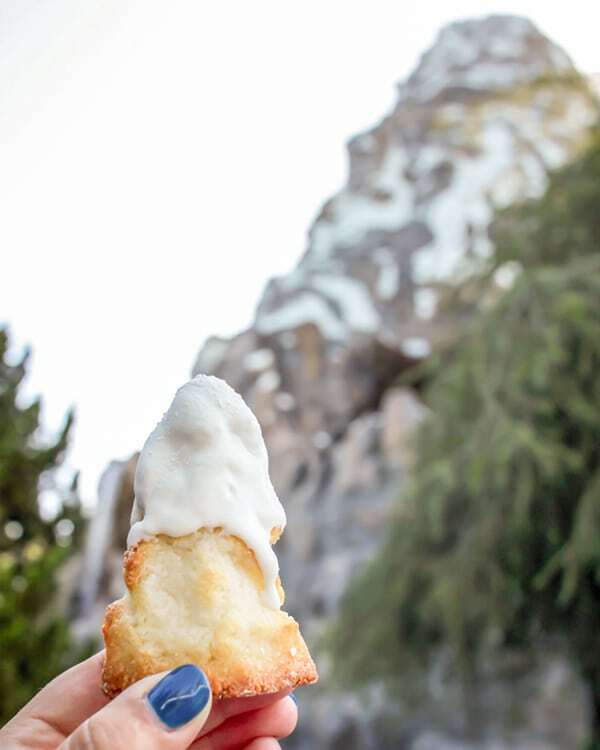 Matterhorn Macaroon from Jolly Holiday Bakery Cafe on Main Street in Disneyland – This tender coconut macaroon topped with melted white chocolate and a sprinkle of powdered sugar is the perfect little sweet treat. Plus, who can resist a Little Matterhorn, Big Matterhorn photo op? 22. 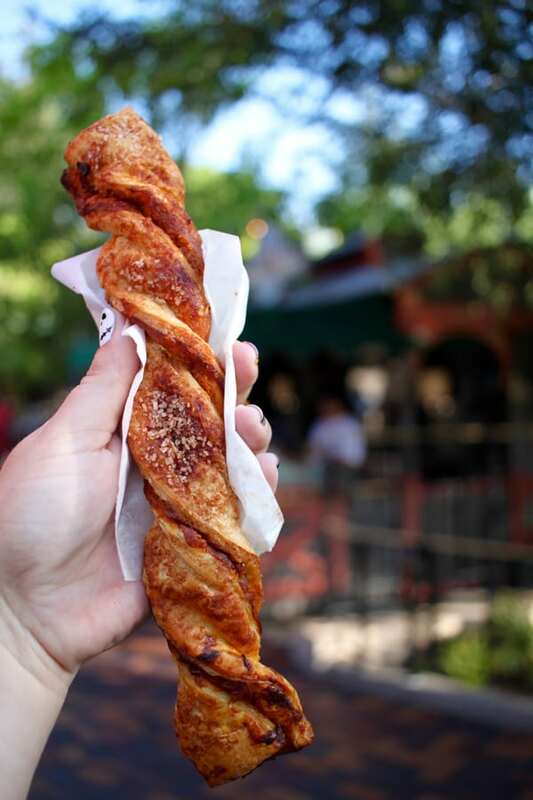 Pumpkin Twist from Maurice’s Treats at Fantasy Faire – if you are visiting the park in the fall, look for this tasty breakfast pastry at the Maurice’s Treat cart. It pairs perfectly with a pumpkin spice latte! 23. Fried Chicken from Plaza Inn on Main Street at Disneyland – for a hearty dinner or lunch, you cannot beat the golden perfection of the Plaza Inn fried chicken. With this meal, you get three (!) 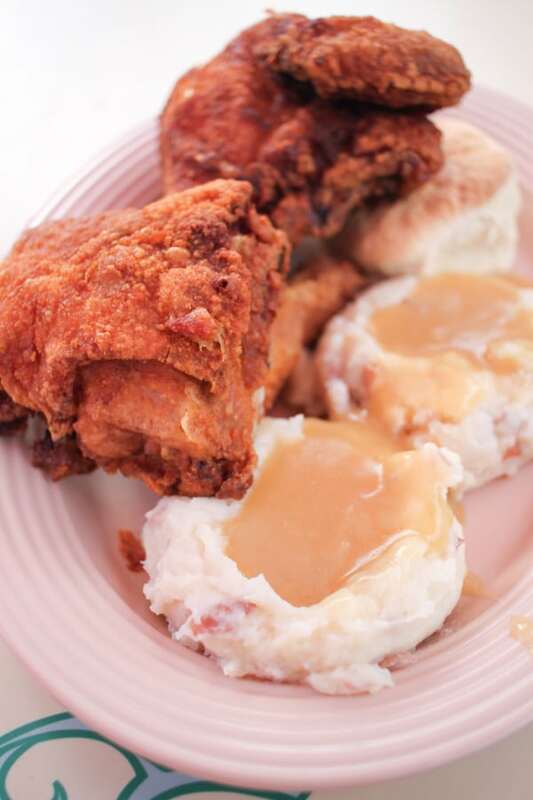 pieces of fried chicken, mashed potatoes, vegetables and a buttermilk biscuit. We often get double mashed potatoes and share. 24. 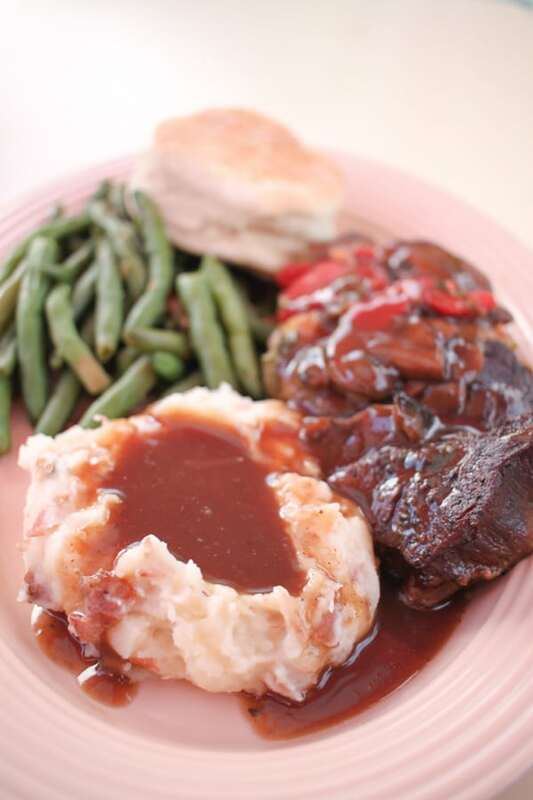 Pot Roast from Plaza Inn on Main Street at Disneyland – if you aren’t in the mood for fried chicken, you might like this tender home-style pot roast instead. Also served with mashed potatoes, veggies and a biscuit. 25. Caramel Apples from Candy Palace on Main Street at Disneyland – These unique caramel apples can be found on Main Street, Downtown Disney and California Adventure’s Trolley Treats. 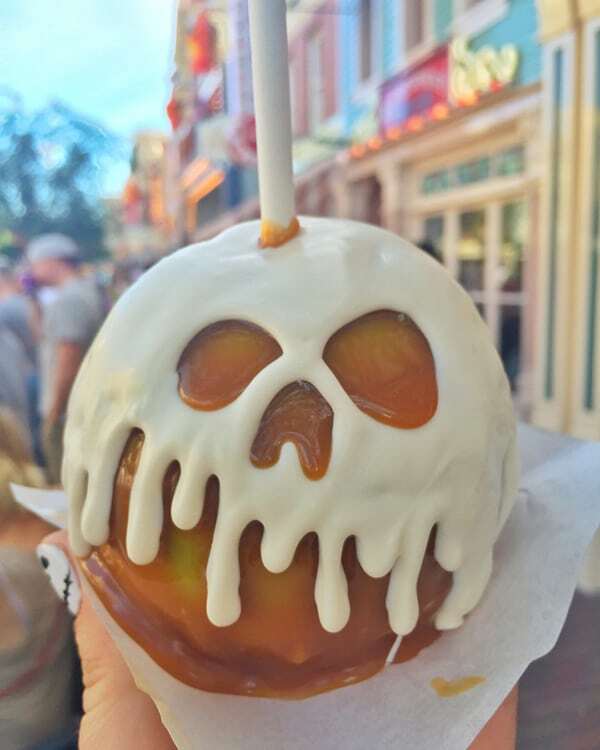 Disneyland’s caramel apples are beautiful, and one of my favorite things to do at the park is check out the new seasonal designs. This poison apple caramel apple was available at Halloween Time. These make great gifts, and the shops offer small clear cellophane type boxes that protect them on the way home. Of course, you can eat these in the park, but they are much easier to slice and enjoy at home! 26. 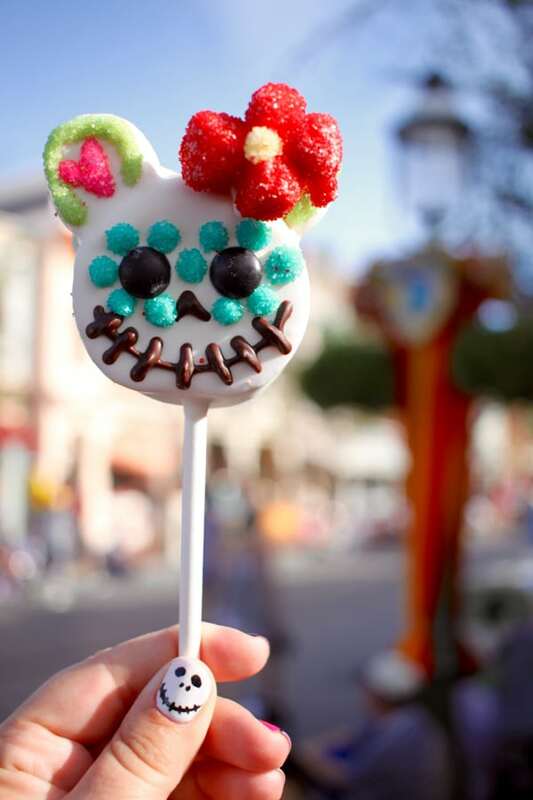 Cake Pops from Candy Palace on Main Street at Disneyland – these can also be found on Main Street, Downtown Disney and in California Adventure’s Trolley Treats. Moist and delicious, these cake pops taste as good as they look. 27. 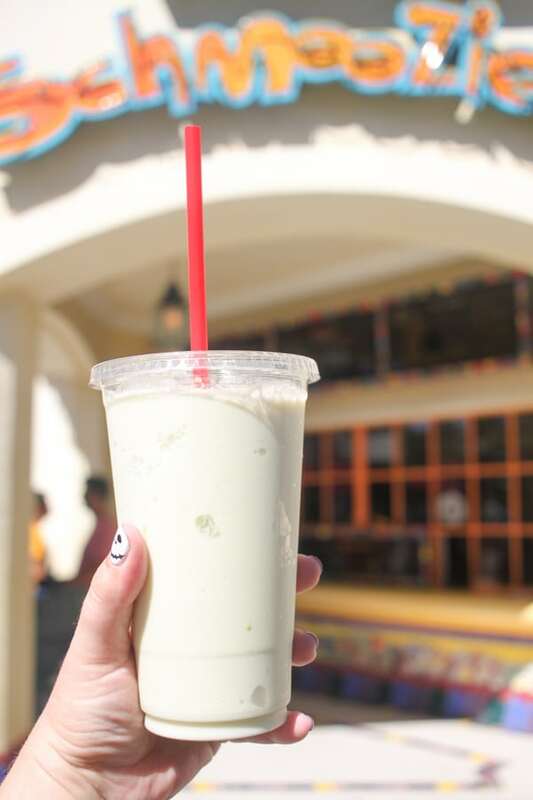 Smoothies from Schmoozies in Hollywood Land at California Adventure – If you need an on-the-go breakfast or snack, try one of these smoothies. They also offer seasonal smoothies, and this caramel apple smoothie was one of the best flavors ever! 28. 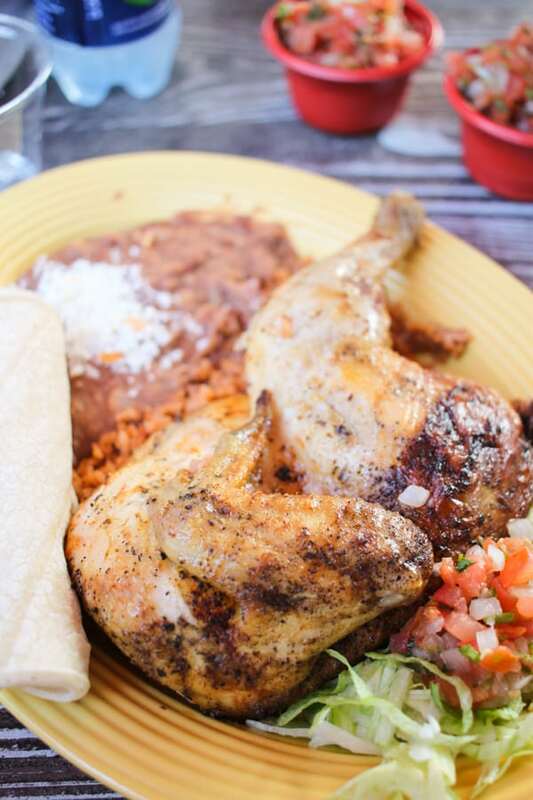 Citrus Fire-grilled Chicken from Rancho del Zocalo Restaurante in Frontierland at Disneyland – Rancho del Zocalo has one of the prettiest patios at Disneyland and this whole chicken dinner is so hearty and delicious. We also love the chips and salsa! 29. 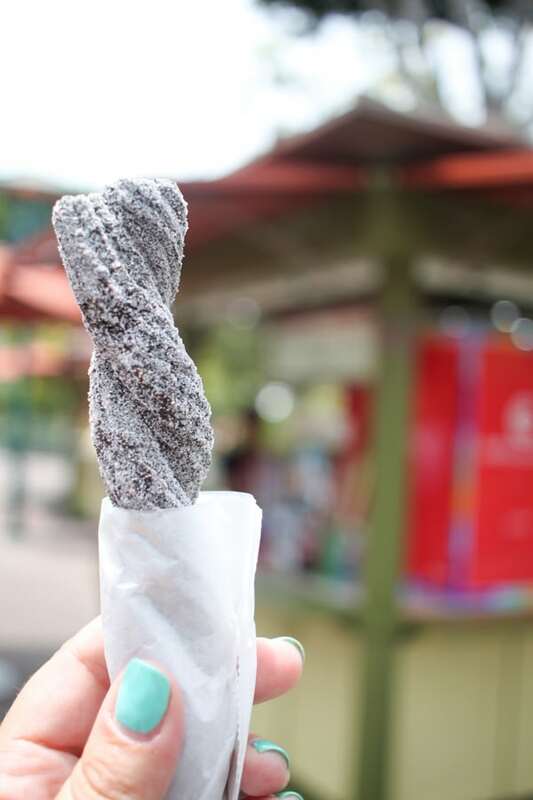 Oreo Churro from California Churro Company in Downtown Disney – If you are a churro fan, you must try the wide variety of flavors available at the California Churro cart at Downtown Disney. This Oreo Churro is a winner, and comes with Oreo Creme dipping sauce! There is even a Churro Ice Cream Sandwich! SEE 29 MORE DELICIOUS THINGS TO EAT AND DRINK AT DISNEYLAND HERE.